ServiceBuilder is a tool that helps create God-honouring, meaningful and biblical gatherings. It allows you to arrange 'resources' (like confessions, creeds and prayers) into services that glorify God and edify the church. You can use predefined 'templates', or you can adapt the standard templates to create your own. Once you have built your service on-line, the service can be saved in MS Word format, ready for use in church. 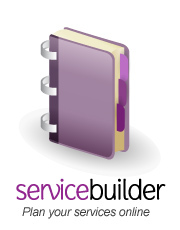 ServiceBuilder can output a "Detailed" and a "Summary" version of your service. The summary version might be useful (for exmaple) as the version that you provide to the congregation, which would contain only the congregational responses. The detailed version would be the version used by the service leader.